D'enfant Creations is all about providing an elegant experience for future moms and their new borns'. This modern fashion trend, provides much more than a baby gift; it provides love, nourish and tenderness. The idea started back in 2009 when my first goddaughter was born. I felt that giving a box of diapers was not good enough and thus providing something more personal and out of the box, was truly the way to go. Surprisingly the gift was such a hit, that people began making purchasing requests for other future moms and their babies. So, whether it's a boy or a girl, this gift will be the sensation of any baby shower or will make any mom feel truly special and delighted. A diaper cake is a deliciously innovative and creative idea that has been prepared and perfectly baked to captivate the hearts of any mother to be. This yummy center piece won’t be served to the guests for dessert, but it will do double duty as an adorable centerpiece and a very practical gift for the new baby. 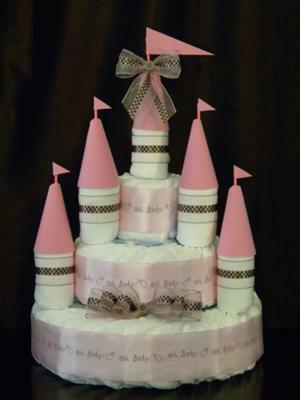 Each cake is baked with lots of care and with very unique ingredients-baby diapers and other quality baby products. So the next time you are looking for a sweet baby gift or centerpiece idea for a baby shower activity. Covering all Puget Sound Area (King/ Snohomish County).